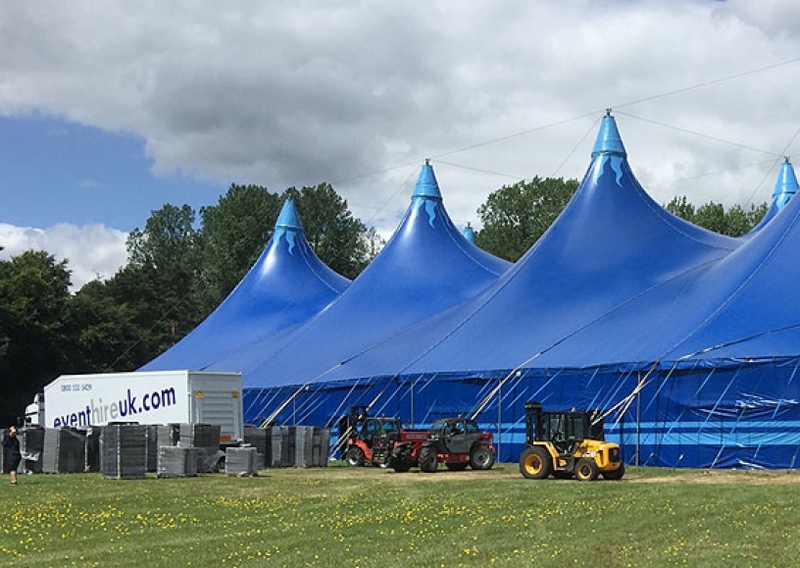 These past few days have seen the Event Hire team supplying and setting up a large amount of furniture hire and catering equipment hire products for a large religious event taking place this weekend in the New Forest in the South of England. The team have been installing 5,000 folding chairs, 48 sofas, hundreds of white patio chairs, cold rooms and fridges along with a wide variety of other event equipment to help make this a fantastic occasion for our client. Pictured is one of the Event Hire trucks dropping off some pallets of plastic folding chairs to one of the event marquees, courtesy of our National Operations Manager Lee Vipond. Whatever your event, from our nationwide network of sales and distribution centres, the chances are that Event Hire UK can help. Our range of furniture hire and catering equipment hire is perhaps the most comprehensive in the country which, when combined with our portfolio of event crockery hire, cutlery hire and glassware hire, makes us the #1 destination for event professionals up and down the country. Don’t hesitate to contact a member of our expert sales team who will be delighted to assist you with your upcoming requirements.